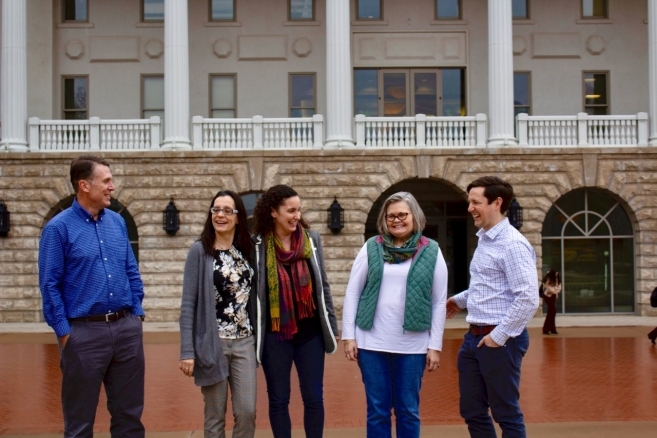 Faculty from Belmont’s English and Foreign Languages Departments are featured this month in Nashville’s Edible Magazine. In the spring semester of 2015, Drs. Joel Overall, Jason Lovvorn, Susan Finch, Jayme Yeo, Mitch McCoy, Natalia Pelaz and Robbie Pinter began visiting Nashville burger joints as a group in search of the best burger in town. The group, dubbed “The Burguerillas,” got their start with Overall moved to Nashville and immediately began a quest to learn more about this new city. Along the way, they explored the meaning of food, culture and the humanities through a presentation at the 2015 Belmont Humanities Symposium. Belmont English alumnus Lisa Bergmanis wrote the article for Edible Magazine, which you can read here. Image provided by Lauren Daugherty.